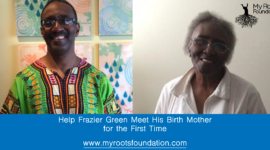 My Roots Foundation recently asked for your help to help Frazier Green Meet his birth mother for the fist time. I want to personally say ‘Thank you’ to everyone who made this trip possible for him. It is a big deal when a person meets their birth mother for the first time. Whether this meeting occurs at birth or after almost 6 decades, there is a bond made between mother and son that can not be broken. Here is Frazier’ story. My days in Gainesville, Florida were awesome. After a few years of dorm living at the University of Florida I moved off campus into the Gatorwood apartment complex. Campus, shopping, my fraternity, and my church were all right around me; it was some of the best times of my life. Our college household functioned like a real family, with each one of us tackling a different household function. Mark was like the house dad, a towering 6’2”, he was the glue that kept us together. Eric, could fix anything, from cars to appliances, if it was broken, “Rick” could fix it. And then there was Frazier! Frazier was a lanky kid with a dark complexion and thick glasses. He had an absolutely contagious laugh and a smile that never quite. He had a beautiful singing voice and a personality that just invited you in. If there was one word to describe him, it would be authentic. You always got the sense that Frazier was real with you. You may not like what he has to tell you, but you always knew he loved you. What a band of brothers we were! It’s been decades since we’d talked so naturally I was excited when I got a Facebook ‘friend request’ from my old college roommate Frazier Green. I don’t exactly remember the last time I saw Frazier, but I will never forget his impression on my mom. One holiday break from school I invited Frazier to spend the break with me at home in St. Petersburg. My mom welcomed us in and in no time Frazier was at home in his new surroundings. By the end of our week in St. Pete. Mom was talking to Frazier and addressing him as ‘son’ while yelling out the window for Alonzo (the dog) to stop digging in the garden. About a month ago, I saw a post from my old friend. Frazier had posted a link to his GofundMe page. He was trying to raise money for a trip to meet his biological mom. What!? I never knew Frazier was adopted! My daughter and I had recently been working to build awareness for My Roots Foundation and thought we could help Frazier and raise awareness at the same time. Frazier and I talked and he was happy to let us share his story. This news was shocking to me as I listened intently to Frazier tell the story. How did this happen? How did ‘baby boy Brown’ become ‘baby boy Green?’ “Have you ever known about your biological family before?” Frazier answered that he tried a few times to locate his biological parents but there just was not enough information. The more Frazier talked, the more I began to feel this tale is a bit of a horror story from our current legal and social context. But things were different back in the 1950s. Ann Brown and Harriet Green worked together for a local laundry service in New . They became friends and talked freely about work and life. One day Harriet noticed that Ann was not quite herself. She inquired about it and Ann shared that she thought she was pregnant. At the time Ann already had 7 children. The thought of another child terrified her. 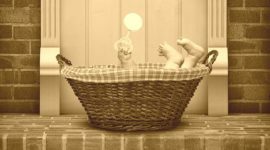 “What am I going to do, I can’t take care of another child?” Harriet told her husband about Ann’s predicament and they agreed that the baby Ann was carrying would be theirs. When it was time to deliver Harriet went with Ann to the Shorehospital. After the delivery the paperwork arrived. As far as Frazier knows, Ann completed the paperwork listing the baby’s mother and father as Harriet and Frazier Green and gave the baby the name Frazier Green Jr. He left the hospital to go to his new family. Harriet was so excited to have a baby. After the birth the two women kept in contact for a short period of time. During their recent encounter Ann tells Frazier that she saw him at Harriet’s during his first year and had doubts about her decision. She came very close to reclaiming him, but knew she couldn’t provide for him. 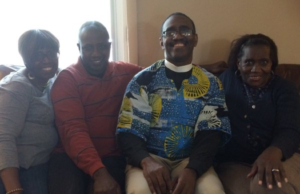 Harriet and Frazier Sr. moved their family to Philadelphia. Later, Harriet and Frazier Green Sr. divorced and Harriet relocated to Gainesville, Florida, where she raised Frazier. 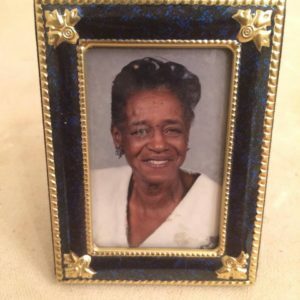 During the summers, Harriet worked in Atlantic City and would send Frazier to stay with relatives in Hollywood Florida, until about middle school. These were not good times. Frazier and his teenaged relatives were often unsupervised and there are still painful memories of those years for Frazier. She valued hard work and always wanted him to be the best he could be. She wanted him to get a master’s degree which he did in 2007. 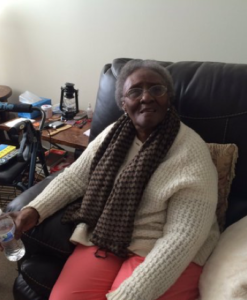 Harriet was able to spend her last Mother’s day with Frazier. The graduation was to take place later that week but she died in his arms days before the commencement ceremony. She had a weak heart though she’d never told anyone, nor complained. Shortly after graduation Harriet fell asleep in her son’s arms. Meanwhile, Ann Brown was going through her own life and raising her other children. She gave birth to ten (10) children in all. Terri, Gary, Connie, Sheryl, Wendy, Billy, Johnny, Frankie, Beulah, and Frazier, the baby she gave away. She had a very hectic life, was twice divorced and then feel in love with a man who made it clear he had no intentions of marrying her. Later on in life, Ann told her children that they had another brother. They knew the baby’s first name of Frazier but in their search, they were looking for a Frazier Brown, not Frazier Green, so no progress was made. LOOKING FOR MORE INFORMATION? CLICK HERE TO SEE RESOURCES FOR FINDING BIRTH PARENTS. Thanks to the modern day amenity of social media. 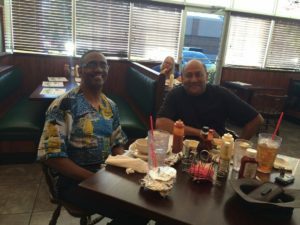 Frazier’s cousin was able to reach out to Frazier on behalf his mother who had just shared the story of the “baby she gave away” during a visit with the cousin on her birthday weekend. After emailing, texting, and talking on the phone, Frazier decided to raise money and go meet his biological mother. One week after Mother’s Day 2016, Frazier and Ann met. First contact with a newly discovered family will take a physical and emotional toll on anyone. So one must really plan and anticipate such a journey or the experience can be overwhelming. Frazier knew he needed to exercise caution. The trip to meet his biological mom was a challenge. Frazier drove from Brunswick to Savannah, GA and boarded a plane to New . His big sister Connie, and nieces Keonna and Casey met him at the airport. As they meet Connie remarked how much “he looks like Gary;”, and “he walks like Gary!” There was an overwhelming since of joy, wonder, and confidence. As they boarded the train to see his mom, they talked like old friends and as others overheard their stories, the tears of joy spread like a wild fire. They finally arrived at mamma’s house, “Baby has come home” was the only thing Ann Brown could say. “Baby” – this is Frazier’s new name! The first day in New it’s just Ann and Baby. Everyone else hangs back and the two of them have the world to themselves. The conversation is awkward only for a moment. Ann does not really know what to say, but Frazier hops right in. Not with questions, but he tells her his story. He starts with; “Harriet did a good job. 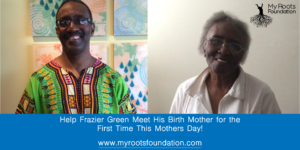 She raised me well.” Frazier described the day and his conversations saying, “it was like we had known each other all along.” He was taken by the fact that the two moms in his life were so much alike. Ann talked about his education and praised his commitment to hard work and getting an education; just like Harriet had done. “They were like twins” Frazier said. As the week continues, Frazier is pulled aside by his sister, Connie and the kids, they tell him “Mom is like 10 years younger since you’ve come.” Frazier meet with other siblings and their kids at a park, and walked on beach “like family.” He had a full week of catching up and learning about his other family. On Sunday he went to church with his sister Connie. It was Youth Day and one of Ann’s granddaughters spoke at the service. Frazier showed off his talents by singing “Amen” during the service. They had a family lunch afterwards and he learned more about the family. When it was time to head back home, Frazier realized Just how much he had to process. What lessons have you learned through all this? I spent a lot of life trying to fit in and now I know I have my own family, my own flesh and blood. That really energizes me. Thinking about my new found family, brings a new sense of being loved, being surrounded, and cared for. I feel really good about myself. I have a since of well-being and safety. They are eager to stay in contact and I already talk to mom every couple days. I have learned that there really is Power in prayer! 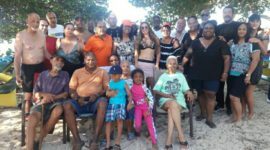 My Roots Foundation is focused on raising awareness of the importance of knowing your family history. Frazier’s story is evidence that there is power and inspiration to be gain by knowing where you come from. We are so grateful to Frazier for letting us share is story and encourage any one with a similar story to speak out so other can learn from your experiences. If you need help finding your family or just learning more about who they were, contact us at alonzo@myrootsfoundation.com. So happy to help Frazier meet his family the Browns! How wonderful.to know you have two families, now! As an adoptive mother I have always hoped my children would look for and find their birth roots so that they would be able to know where and who they came from. I know that being able to complete the picture of yourself is in part your ancestry. God gives us what we need for life at the right time. Thank you Frazier for your story. I see how blessed you were with the Greens and now with the Browns.